Chosen by Microsoft as their flagship phone for Windows Phone 8, this device will be going up against the likes of the Nokia Lumia series, and come out on top. HTC’s take on the Windows Phone operating system is noticeably different, with the clean, sleek user interface with the iconic “tile” home screen, but plenty of perks. Don’t let it’s thin, sleek design fool you, there are plenty of features and power packed into this small package. With a generously sized, crisp and vibrant LCD-2 display, you can expect the best entertainment experience. With the Dual-Core 1.5 GHz processor, you can expect smooth browsing, fast streaming, and instant sharing. Pair it with 1GB of RAM and 16GB of internal storage, and you have plenty of space to store your media without sacrificing performance. You’ll also have all of the support you need for various file types. Not only that, you also get a stereo FM radio on board, as well. With an 8MP rear facing camera that offers high definition 1080p video, Geo-tagging and touch focus, and photo and video editing software. You’ll also get bright LED flash and video light for video recording, as well as continuous auto focus in video capture mode. The front-facing camera is a surprising 2.1MP, which is ideal for self portraits, and utilizing video chat and calling with Windows’ own Skype services. 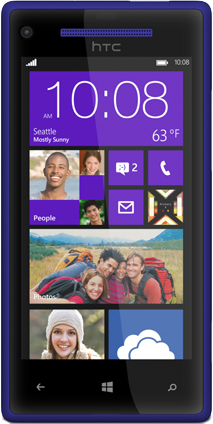 HTC Windows Phone 8X users will be spoiled by the amount of connectivity support and options there are available. Not only is there WiFi, 3G, DLNA and A-GPS, you also have Bluetooth and an NFC chip. Connecting on the go is fast and easy, with plenty of coverage and support, data transfer is at it’s best. In a sea of bland black, white and chrome handsets, it’s refreshing to see HTC take a risk and breathe some life into the smartphone palette. The sleek uni body chassis comes in a fun and bold “Limelight Yellow” neon yellow color, the vibrant “Flame Red”, a deep blue-purple color called “California Blue”, or the traditional “Graphite Black”, all in a smooth matte finish. With the latest update, Windows Phone 8, you can enjoy plenty of improvements to the operating system, including: safe and secure mobile payments and NFC chip with “Wallet”, media streaming with your XBox thanks to SmartGlass, and navigation service with the powerful NAVTEQ maps, which offers offline use, turn-by-turn directions, dynamic public transportation routing and more.